Last week I posted a recipe to make Focaccia Genovese, and this week I made it again with the intent to try a different, much stronger type of flour given to me by a friend. The stronger flour made the kneading process tougher, as the dough was even stickier and harder to manage. This time I made two trays of it, one with mini plum tomatoes and Rosemary, and the other one with red onions and Rosemary. I blanched and peeled the cherry tomatoes, then oven dried them for an hour or so to enhance the flavour. 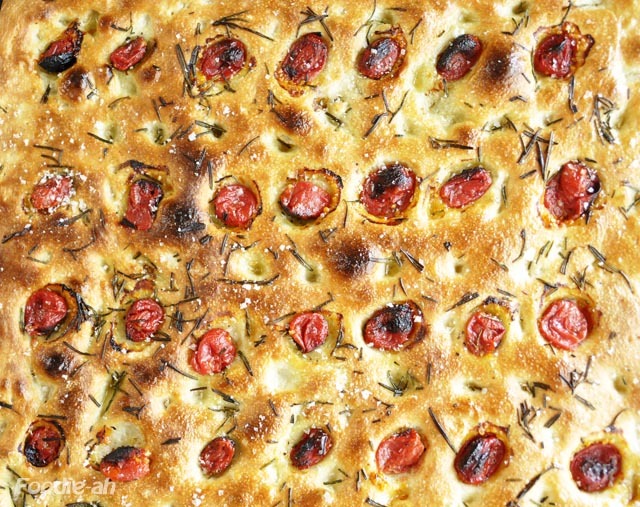 I cooked the plum tomatoes focaccia at a slightly higher temperature than usual (245C), which resulted in a thicker, crispier surface. An interesting result, although next time I will stick to 230C and I will wet the oven dried tomatoes to prevent them from slight burns. 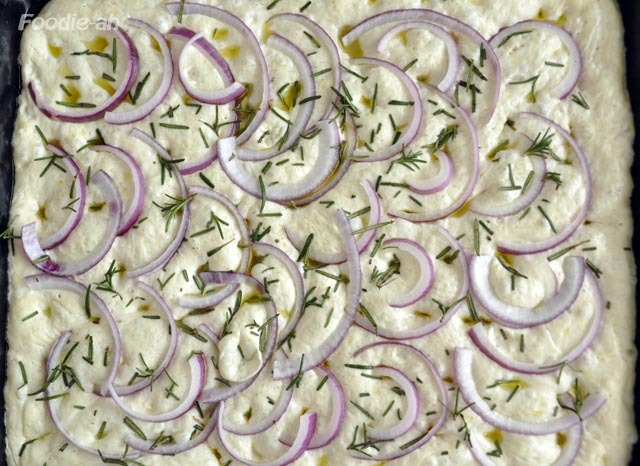 The color contrast of red onions looks beautiful on bread both before and after baking. 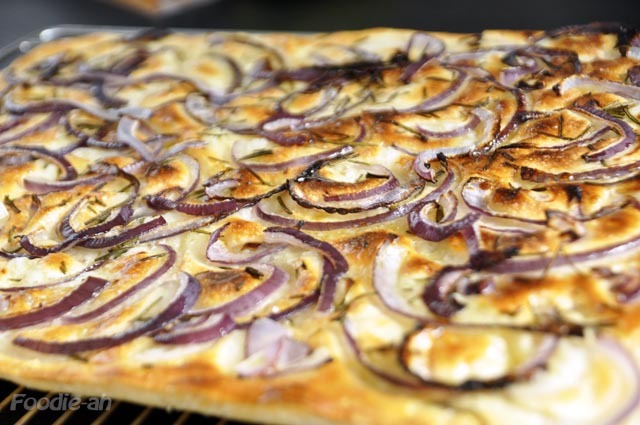 While red onions look better than white ones, their sweetness doesn't particularly suit this type of bread. I will go back to regular white onions going forward, since they have a more distinct onion taste. I could without a doubt tell the difference between the two flours (Prima bread flour and my friend's strong Italian flour). I personally prefer the strong flour, which resulted in a more airy and spongy dough, with bigger bubbles through the section. Unfortunately I am not sure where you can source strong flour in Singapore, but a visit at the more exotic culinary shops might be worthwile. Thanks Foodie, that's some nice bread! Interesting follow up as I was wondering about the flour types since your 1st Focaccia post - the Genovese recipe you sourced at vivalafocaccia.com calls for 00 which is the 'finest' pastry flour, definitely not 'bread' flour. I find buying flour in Singapore is a bit of a lottery - the flour can be stale, especially if it's imported and comes in paper packets (e.g. every packet of 'strong' organic bread flour from Coldstorage I've tried). If you find a good source pls share the lobang ;-) The locally milled Prima flours are generally a safer bet but there's not much variety at the 'strong end' of the flour spectrum. 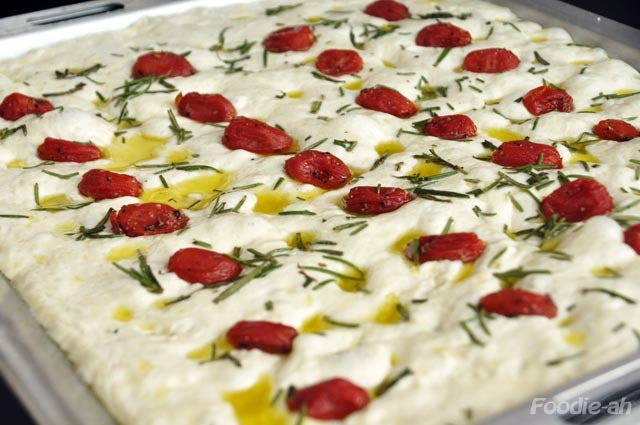 You are right, on wlafocaccia they always use "Farina 00", but I believe that's just to simplify, since this is the most common flour found in the market. However, that doesn't mean it's the best flour for the job, depending on the type of result you prefer. Finer (00) flour makes a more compact bread, while stronger (bread)flour has more hold and makes bigger bubbles. I was very satisfied with this "extra strong" Italian flour which was given to me to try. He uses it to make panettone, and I think you might be able to buy it from Culina. I never tried to buy other flours apart from Prima flour, and another American brand (non organic) which you can find in Cold Storage (I bought their semolina flour). I agree that the variety is limited as soon as you need something a little more specialised. The "bread flour" is the strongest they have, and it's not so strong. I made sourdough yesterday from a natural starter (called Bob, passed over through generations and given to me by a friend) and it came out fine. You inspired me, so I am making ciabatta tonmight. I will let you know how it goes! Milling your own flour - you are moving into it even deeper - it would be interesting to find out how you can control the "strenght" of the flour at milling time. Do you have a kitchen aid, or do you knead by hand? An Italian in Singapore, recording memories and images of his culinary experiences. The best Dan Dan in Singapore?